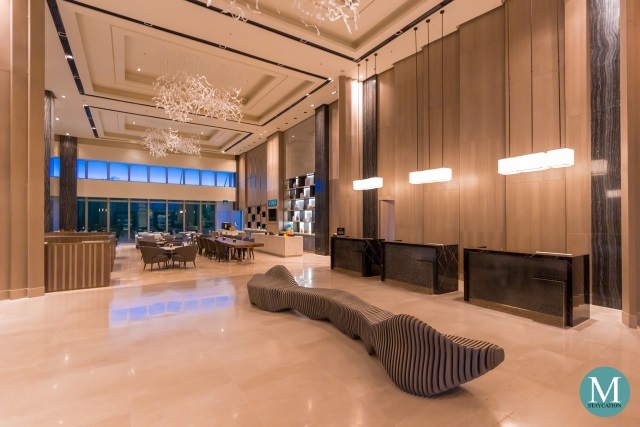 The dining scene in the Philippines is getting more and more exciting as the taste of the Filipino diners gets more and more sophisticated, and demanding for that matter. 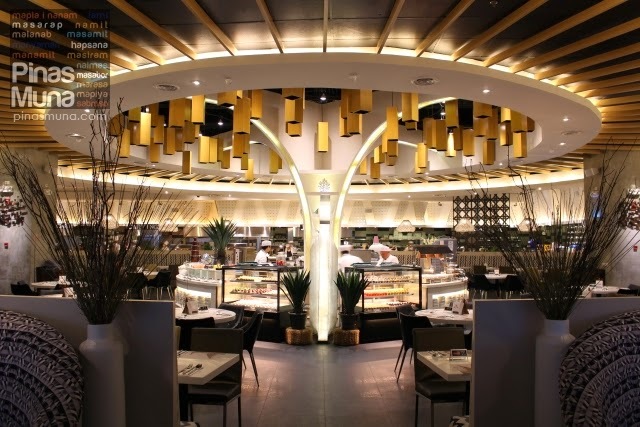 Everyone is is constantly looking for new flavors and new food concepts to satisfy their sense of culinary adventure. 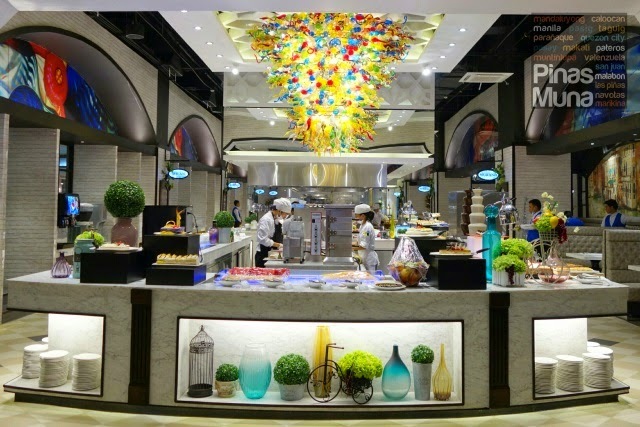 This August, Vikings Luxury Buffet, the Philippines' largest buffet restaurant, will be serving streetfood from around the world in all of its branches. 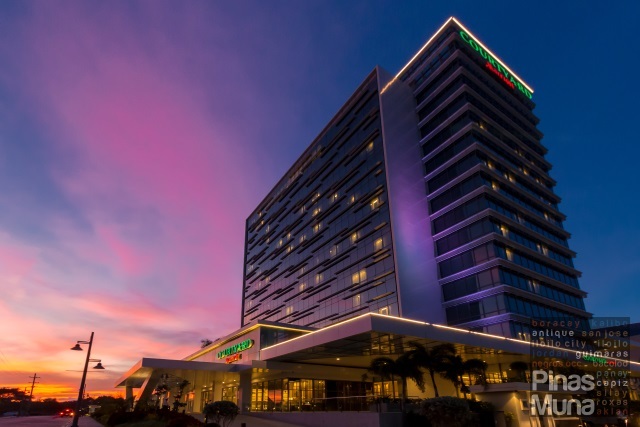 Available on lunch & dinner during weekends, and dinner time only during weekdays. Verna of Team #PinasMuna shares some of the world street food that guests can enjoy at Vikings SM Lanang in Davao City. 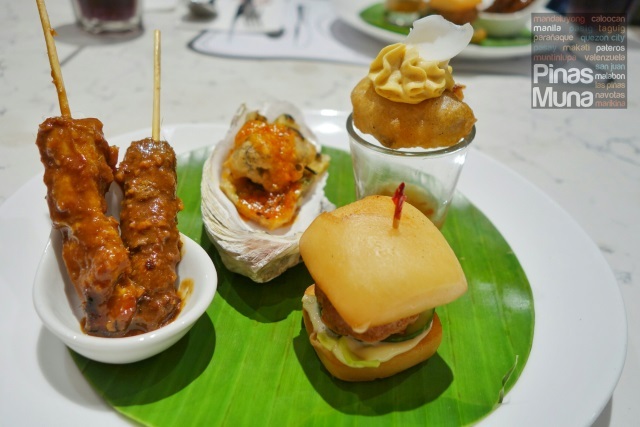 Let's look at the dishes prepared by Vikings Executive Chef Anton Abad for a preview event prepared by Vikings for Davao-based bloggers. 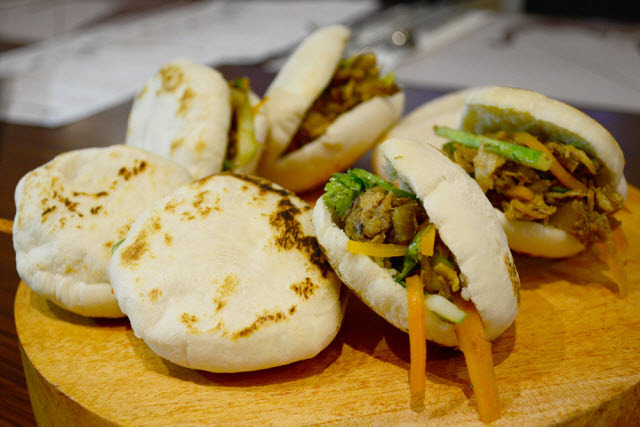 Rou Jia Mo (China) -- These meat burgers, or Chinese hamburgers, consist mainly of minced pork meat and julienned veggies, stewed and stuffed in a flatbread or bun. 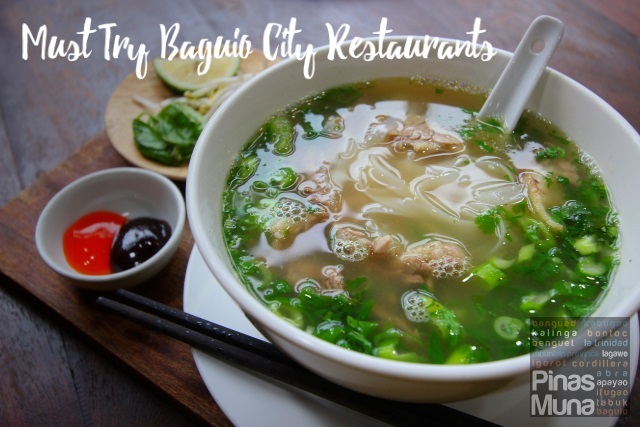 I love its combination of flavors as it fits the Filipino tongue. And why wouldn’t it be? We’ve been eating Chinese food since time immemorial. They’re best eaten when the buns are still warm as they’re still soft and not overly chewy. 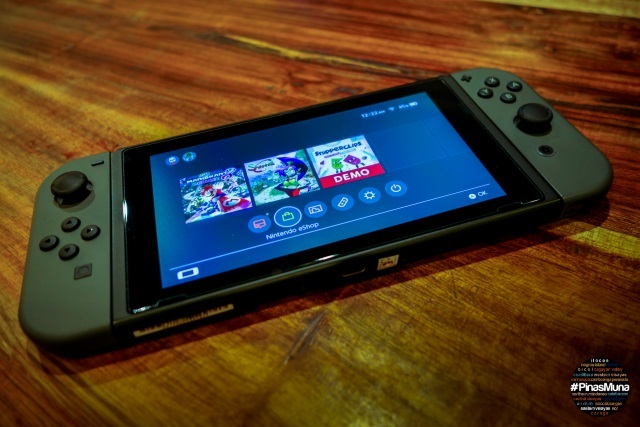 You should try this! Suppli (Italy) -- Said to be one of Rome's beloved street foods. 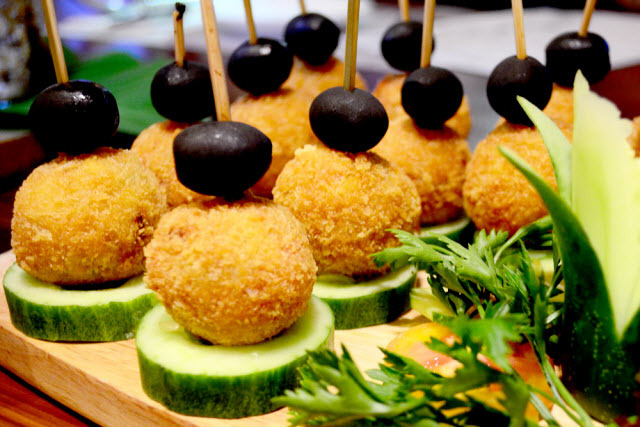 These balls are made mainly of rice, hence they’re commonly called Italian Rice Balls. There’s a mishmash of flavors in here: tomato sauce, egg, bits of meat and the mozzarella made these balls a stand-out. You shouldn’t miss this! Durum (Turkey) -- Istanbul, the largest city of Turkey is constantly written by the world’s notorious foodies to have one of the best street foods. Durum is, without a doubt, considered to be one of their favorites. 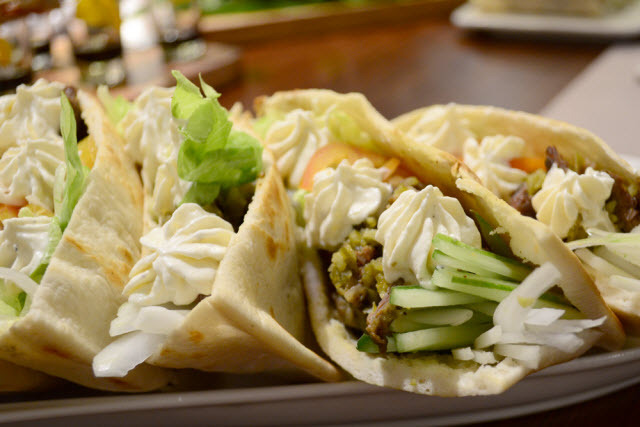 Pita bread is filled with spiced beef and veggies. I suggest you take this slow. Pita can be very filling as it comes in a generous portion. 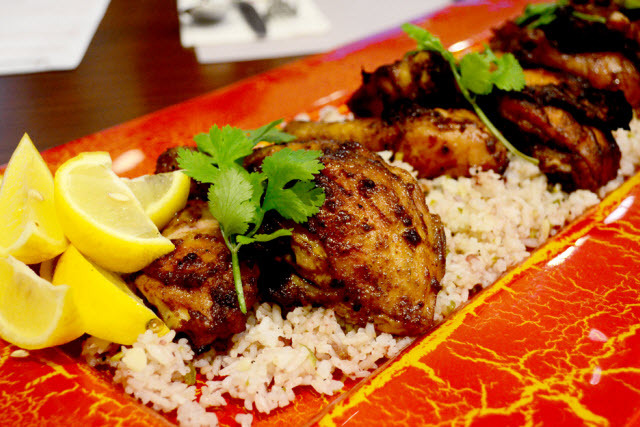 Jerk Chicken (Jamaica) -- Whatever the story behind, how ever this is made, one thing is certain. I can thrive in the streets of Jamaica and the Caribbean with this Jerk Chicken alone. This moist, fragrant, all-spiced and warm piece of a fowl is really good. The accompanying rice in mild fusion of spices and herbs perfectly hit it home. A full meal indeed! Tacos al Pastor (Mexico) -- I’m a big fan of Mexican food. They’re unpretentious and superbly tasty. 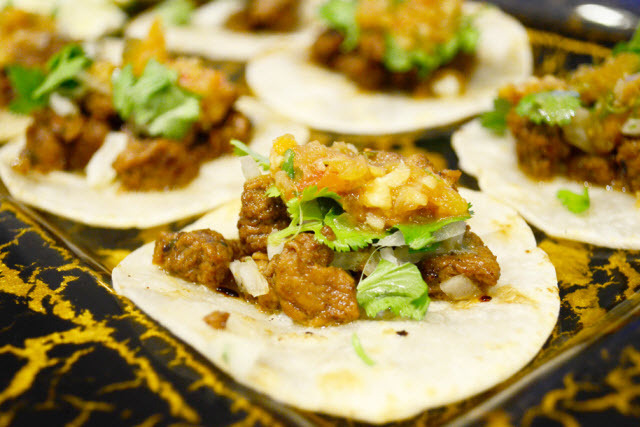 This particular dish is made out of thin bits of pork with a Mexican flair of spices and herbs laid on a limp tortilla. Two swift bites and I am one happy diner. A recommended pick! 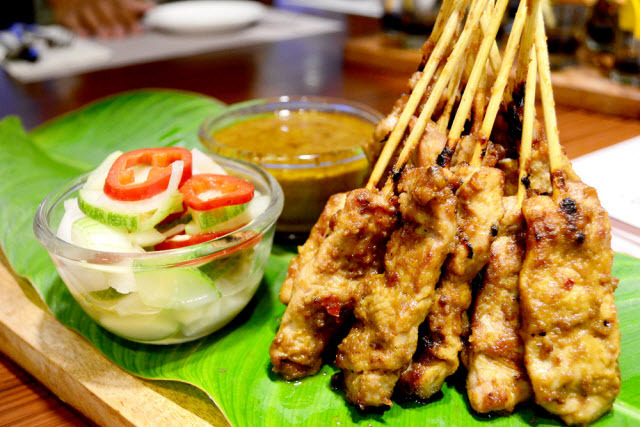 Satay (Indonesia) -- More like our afternoon street barbecue here is Davao only that it comes with a peanut sauce. So if you want something out of your usual ketchup/toyo-based barbecue sauce, then this is a satisfying pick! Espetinho (Brazil) -- Usually, this comes in a variety of grillable raw meat such as pork, spiced beef, chicken, prawns, and sometimes even hotdogs. The meat is threaded all together in a little skewer and is cooked over a grill. The ones that we sampled were pork with mushrooms and peppers neatly corded on a skewer. I would say that Vikings' version looks like a little posh than the actual though, with the sauce in a jigger, but this is the closet to real it can get. Tastes good to me! Pick a stick if you wish to experience Brazil! Crêpe (France) -- Probably one of the most versatile street foods I’ve ever known. Crêpes can be made with any filling you want: Nuttela, choco syrups, jams, fresh fruits, you name it. 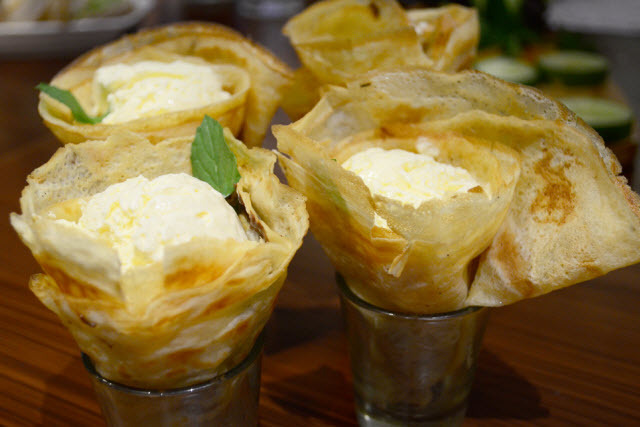 And we got a scoop of ice cream in our crêpe. Sweet! 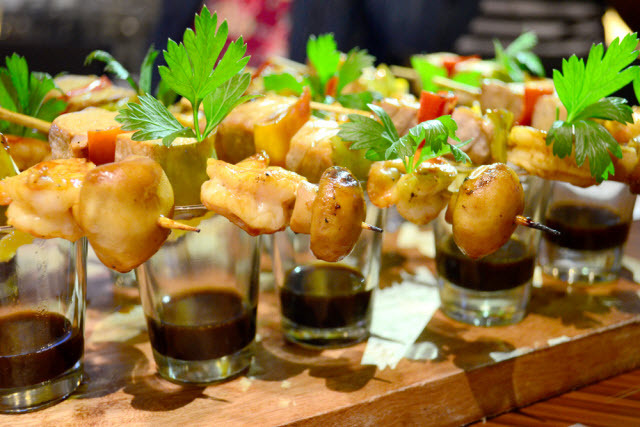 Just a perfect dish to finish-off an awesome world street food experience here at Vikings! 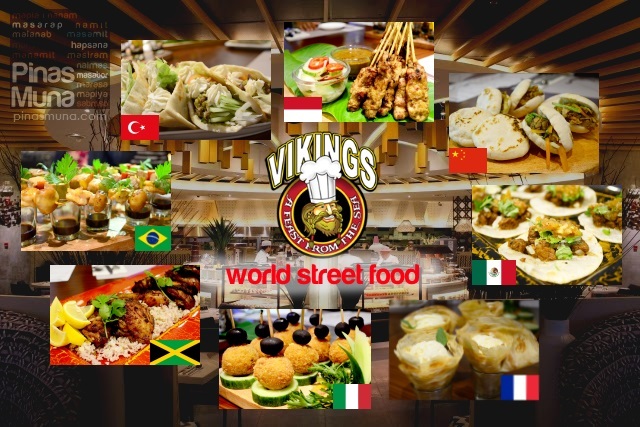 Meanwhile in Makati, Edgar and I joined other Manila-based bloggers at Vikings SM Jazz Mall to try some of the world street food prepared by Vikings Sous Chef Von Ragudos. Appetizer -- Chef Von prepared a set of four appetizers: the Chori Burger (Philippines) has homemade chorizo patty in fried mantao bread; the Oyster Omelette (Ssingapore) is made of cooked-to-perfection oysters, eggs and a crisp-finish of flour mixture, and served in an oyster shell; the Balut Deconstructed (Philippines) is a beer-battered duck embryo, topped with a very interesting balut-mousse, and garnished with chicken floss and sliced albumen (bato ng balot); lastly, the Beef and Chicken Satay (Indonesia) are made with tender beef and chicken served street-food style with rich peanut dipping sauce. 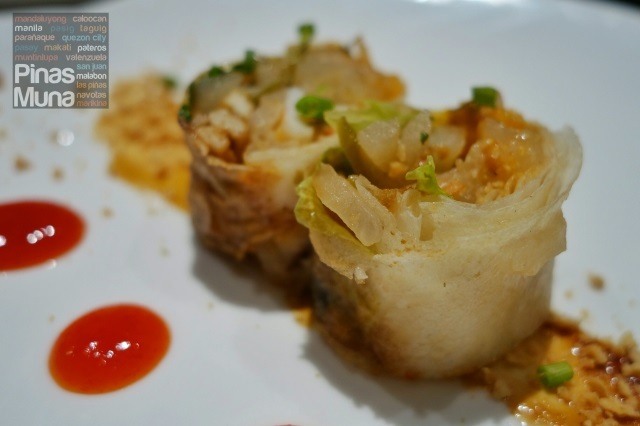 Popiah (Malaysia) -- is a spring roll made with braised jicama (singkamas), tofu, shrimp and ground peanut. 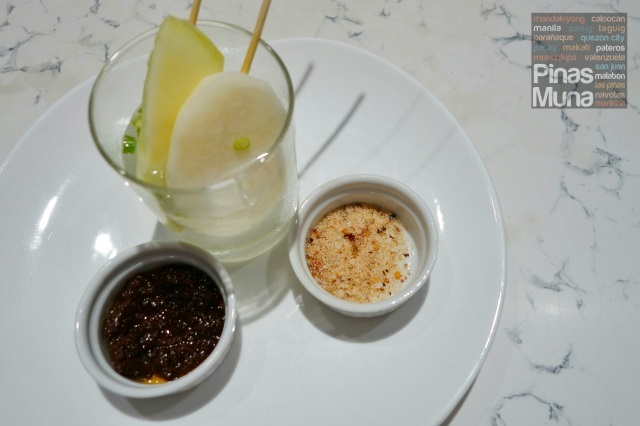 Mangga & Singkamas (Philippines) -- slices of fresh green mango and jicama (singkamas) served in a glass of shaved ice to keep them cold, on the side are servings of bagoong alamang (shrimp paste) and spiced salt. 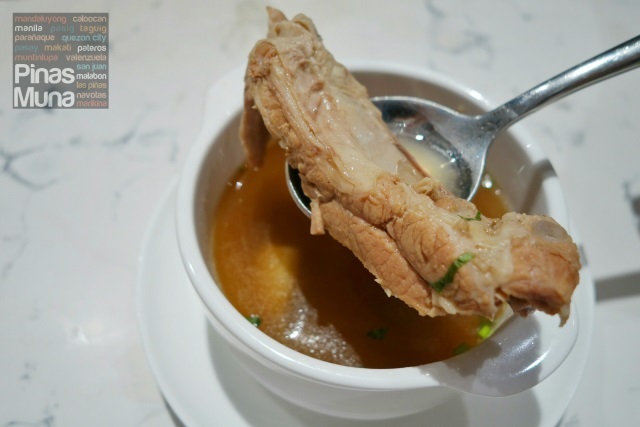 Bak Kut Teh (Singapore) -- We're happy that Bak Kut Teh is having a come-back a year after the #JalanMakanan themed buffet at Vikings in August 2014. We really missed this meaty pork ribs simmered in a complex broth of herbs and spices. 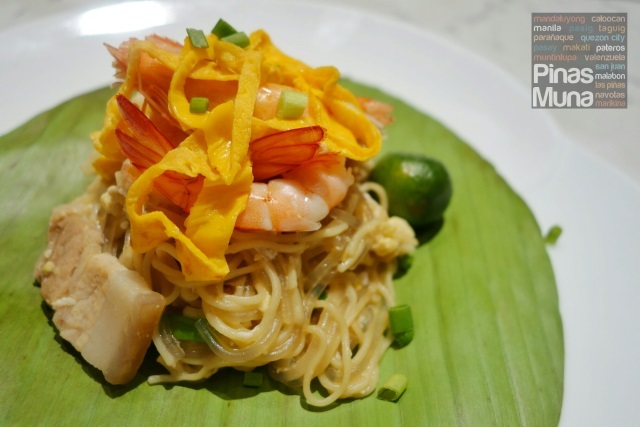 Hokkien Mee (Singapore) -- Another South East Asian dish making a come-back this year is the Hokkien Mee. 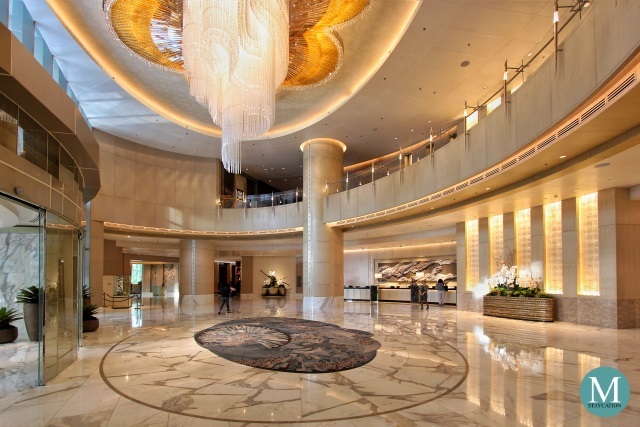 This year, it really got more sumptuous. This version has a mixture of yellow noodles and thick rice vermicelli, fried with eggs and richly flavorful prawn broth, topped with prawns and served with chili paste and calamansi on the side. 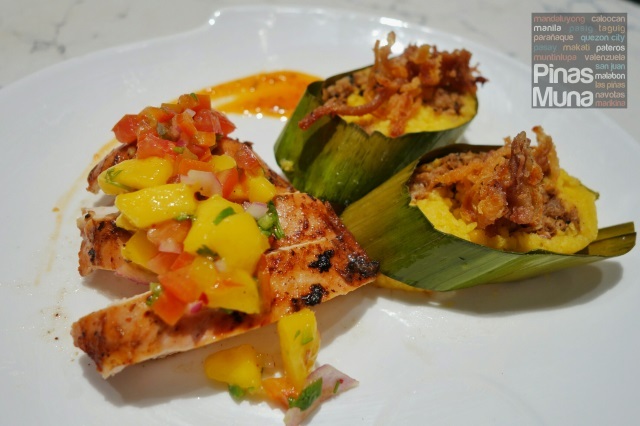 Jerk Chicken (Jamaica) -- chicken flavored with spiced rub and served topped with mango salsa. Tamales (South America) -- is made of steamed corn rice, given a Filipino twist by stuffing with shredded pork adobo and salted egg and garnish with pork floss. 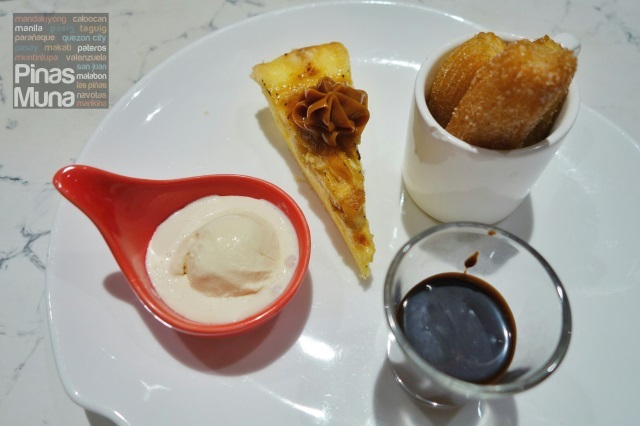 Bananacue Pie (Philippines) -- is an egg custard and fried plantain pie topped with dulce de leche and served with vanilla ice cream. Churros (Spain) -- is basically a fried dough-pastry based snack served with rich chocolate coffee sauce as dip. So there, you've see what guests at Vikings can expect during this month. Note that each Vikings branch will have its own set of menu so the experience will definitely be different in every branch.